Earthy and sweet flavors mingle in this versatile and tasty salad. 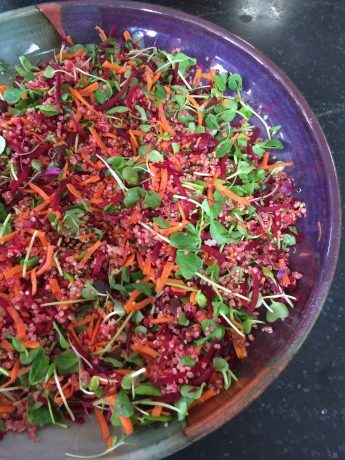 The stunning color comes from raw beets grated and added to the quinoa. A dressing of orange, lemon and lime citrus with a dollop of fig spread or honey adds a fresh, sweet note. I’ve had several beet skeptics try the salad and pronounce it delicious. Add quinoa, 1/4 teaspoon salt and 1 cup water to a small saucepan. Bring to a boil and then reduce heat to low, cover, and cook for about 10 minutes, until the water is absorbed. Turn off the heat and let the quinoa sit for 5 minutes. Remove the cover and set aside to cool completely. While the quinoa is cooling, shred the carrots and beets (I find this easiest using the shredding disc of a food processor) and mix with the cooled quinoa, mixing until the quinoa takes on a reddish hue. Gently mix in the apricots, cranberries and desired amount of greens. If using pea shoots, you may want chop off stems and roughly chop. Make the dressing in a small bowl by whisking together orange, lime, and lemon juices, fig spread or honey,, shallots, olive oil and salt. Whisk until all the fig spread or honey is dissolved. Taste dressing on a bit of the salad and make any adjustments, such as adding additional salt or lemon if too sweet for your taste. Dress the salad just before serving. It can be made ahead and combined later. Fig Spread Note: Dalmatia makes a delicious fig spread that I use in dressings and vinaigrettes instead of honey or maple syrup. I usually find it in the cheese section at Whole Foods Markets.